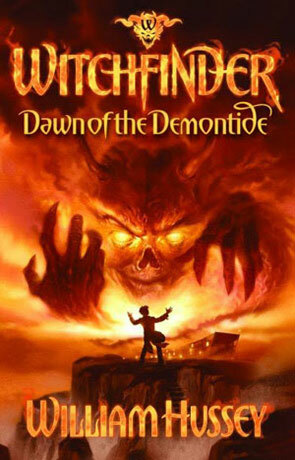 Witchfinder - Dawn of the Demontide is a young adult fantasy horror novel written by William Hussey. Jake is a fairly typical teenager, although admittedly a bit of a loner and spends much of his time reading horror comics, he is quite bright and bored at the school he attends. He has a massive knowledge of horror and demonlore, which he obviously understands isn't real. It isn't long however before this is called into question after an encounter with "the Pale Man" and his impossible sidekick "Mr Pinch" - under a tree called "The Demons Dance", everything he thought he knew about fact and fiction becomes seriously twisted. Hundreds of years ago a Witchfinder managed to close the gates against the horde of demons (the demontide) but ever since then the fragile barrier between their world and ours has been at risk. Once a generation the Doorway weakens and two groups vie to control this portal - The Coven to open and release Demontide and the Elders to keep the doorway shut. This novel is clearly aimed at the young adult market but is not really suitable for the younger reader as there is quite a bit of descriptive gore. Witchfinder - Dawn of the Demontide is quite an accomplished novel, written in a more understated style than many young adult horror novels around at the moment, with no gadgets to speak of and no uber vampire's. The book instead concentrates more on characterisation and visceral gore, with lots of top quality action. The protagonist is geeky and nerdy enough not to come across as a superhero while the plot moves along at quite a fast pace, with many twists and turns along the way. Witchfinder - Dawn of the Demontide is a fast, intelligent, fresh novel that will keep you hooked to the last, recommended.